Below is a common error, the “Network Status Error” that can develop due to various hosting, WordPress, or plugin conflicts. Step 1: Why does this error occur? All of the WP EasyCart admin apps utilize a single URL website entry point on your WordPress site. The Desktop PC/Mac app, iPad app, Android apps, and the WordPress plugin app all point to a single URL to make request calls and get data, but if that url is blocked, unavailable, or secured by some security protocol, it can cause a network connection failure. Remember, WordPress is an ever changing landscape mixing different web host settings, wordpress plugins, themes, and coding from many sources. No two WordPress sites are ever the same when you inject all of these variables, and as a web designer/developer/owner of one, the idea is that you know this landscape and can adjust to make all the plugins, themes, and coding work together… but sometimes it just doesn’t play nice together. Step 2: Where to start fixing this issue? 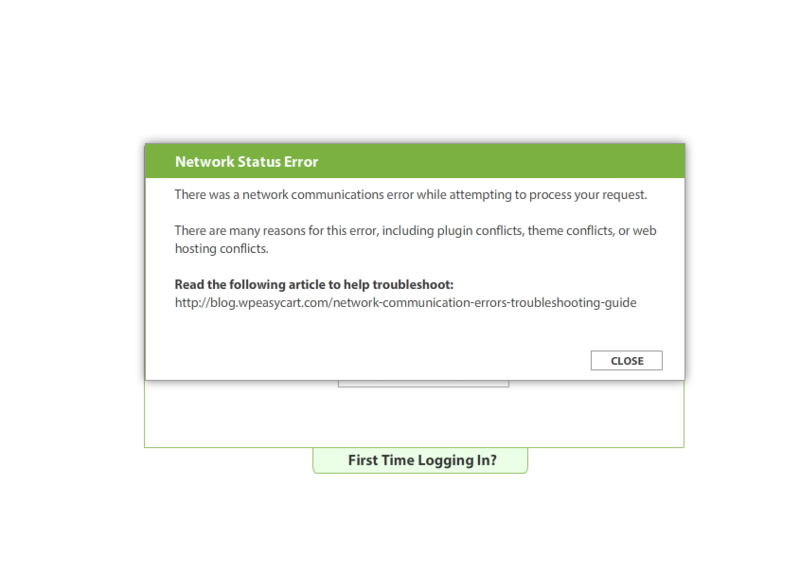 Now that we know the most common cause of this Network Status error message is that we can not reach a url within the EasyCart plugin, we can look at common fixes. 1st – Lets see if you can reach a regular PHP page, possibly a plugin conflict or security plugin blocking any outside access to a PHP page. An easy way to know is to look at the following address on your server: http://www.yoursiteurl.com/wp-content/plugins/wp-easycart/inc/admin/ec_checklist.php. You should see something like this below. If you do not see the above, perhaps a 404 not found or other server error, or even a redirect to your website, then you need to find out why. Your web host provider can often find out if there is something redirecting on your host platform, or perhaps you have a plugin that is causing a redirect to any direct PHP page being accessed. 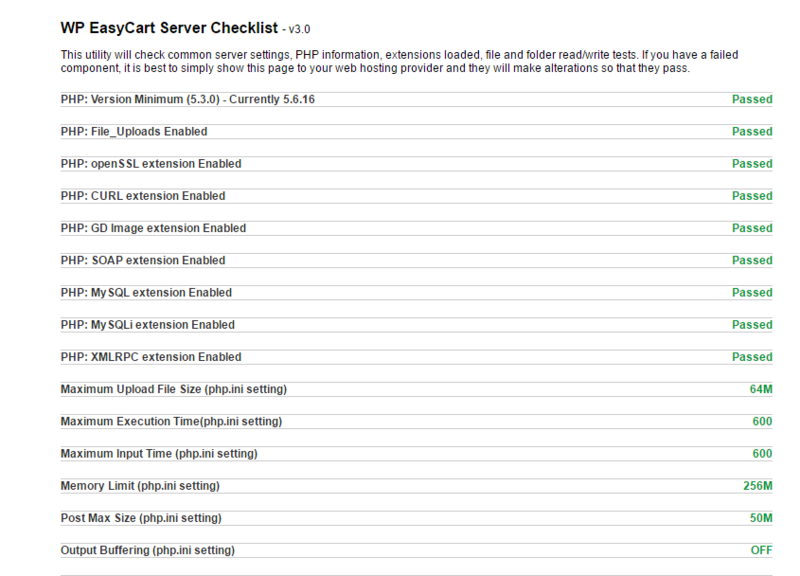 2nd – The next step to complete is to deactivate all plugins except EasyCart and see if you do not receive the error message. If you are able to get the store admin software to startup, activate plugins one at a time until you can find out which plugin is causing the conflict. This is a recommended method by WordPress to help troubleshoot and find conflicts. 3rd – If no plugins caused the issue, try switching themes quickly, and do the same test. If the store admin starts up, then there is something in the theme causing a conflict and you can narrow down the problem. Step 3 – I’ve completed the basics above, now what? The next area of concern is to look for caching systems. There are two types of caching systems, WordPress plugins and Server side caching. It’s important to understand that many WordPress websites are static websites, with little changing content, blog posts, or images. These are great sites for caching systems, but a dynamicly changing system like a WordPress eCommerce system is very different. Products are changing, customers have active carts, logins, and consistently changing content. This makes caching systems not work well with eCommerce all the time. 1st – Disable any WordPress caching programs or security plugins. Popular ones such as W3 Total Cache, WP Super Cache are good ones that may be installed. We utilize WP Super Cache, but we have found that W3 Total Cache has various settings and some of the caching causes the Network Error in our plugin to not work, particularly Database Caching. So start here with these plugins, disable them, see if the admin console works. We do recommend WP Super Cache, and have had little issue with it on our server environments. 2nd – If you still have issues, I would contact your web host provider. Server side caching programs such as CloudFlare or Varnish will cause this Network Status error message. It’s a common problem with a lot of plugins in WordPress, and it’s a good idea to leave these off. Most host providers will disable them if they are turned on. Step 4 – Do you need a new web host provider? Maybe! We have found godaddy hosting to be one of the top culprits in this situation. They are very proprietary and often have security in place for some reason that makes many WordPress functions not operate as smoothly as we would like. Sometimes they have CloudFlare on the server running and it requires turning OFF, other times they have mod_security rules in place causing the issue. We really love WP Engine hosting, which is very very fast and works great with WordPress, but it is a bit expensive. Bluehost seems to be another standard hosting environment that we like, particularly their VPS hosting. While we hate to see people have to move, often it’s such a large comparability problem and we have no control over it until the hosting environment is setup well for WordPress and eCommerce platforms. For all EasyCart license holders and active support members, we really like to hear from you and help in any way we can. Send us a support ticket by logging into www.wpeasycart.com -> My Account and let us know. We will walk through the same steps here to troubleshoot until we find the culprit.